Until recently, King’s Hall at Old Parliament House has featured a number of portraits of well-known parliamentarians, including past prime ministers. Two of these were Bryan Westwood’s Archibald-prize winning ‘The Prime Minister’, depicting Paul Keating, and Louis Kahan’s ‘R.J.Hawke’. Both portraits were on loan from the Australian Labor Party, and they were popular because they portrayed a side of the two men’s personalities that was perhaps lacking in other depictions. Once all of the portraits were cleared from King’s Hall in 2015 the Hawke and Keating paintings went into museum storage. In late 2016 the Australian Labor Party national executive made the welcome decision to permanently gift the Hawke and Keating portraits to the museum. This is great news for a number of reasons. Both paintings can now be kept and cared for, and occasionally displayed, for all Australians, and they are examples of significant work by two distinguished Australian artists. Austrian-born Louis Kahan had a long and successful career in painting, printmaking, design and stained glass. Before joining his family in Australia (they emigrated to Perth after the Second World War) he worked in Europe, designing costumes for Josephine Baker and Collette and working as a freelance illustrator for newspapers and magazines. During the war he painted portraits of wounded allied soldiers, and then worked in Hollywood. Eventually settling in Melbourne, Kahan established himself as a portrait artist, with his 1962 portrait of author Patrick White winning the Archibald prize. His portrait of future prime minister Bob Hawke was a finalist in the Archibald competition in 1975. Bryan Westwood, who painted the Paul Keating portrait, was born in Peru and was educated in South America and Australia. He was based in Australia but spent periods travelling and working in Europe and the USA. A painter and printmaker who won the Archibald Prize twice (his portrait of artist and critic Elwyn Lynn won in 1989), he also painted landscapes, interiors, still-lifes and figurative works. 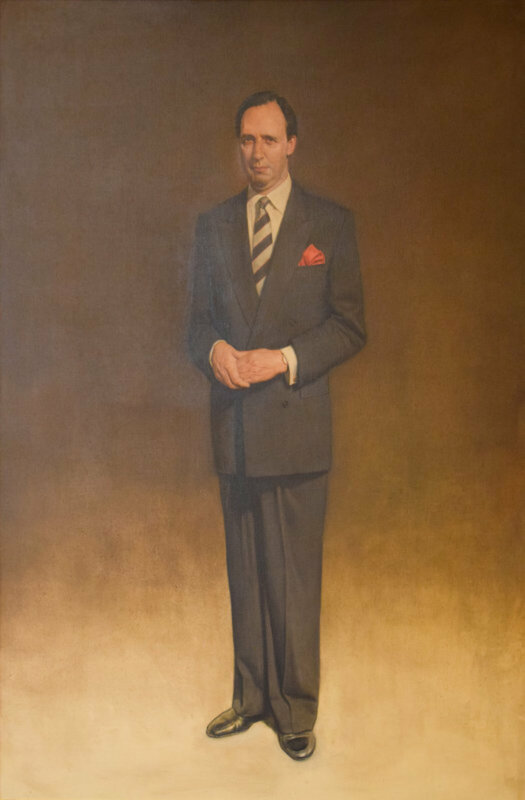 The Keating portrait was probably painted during the first months of Keating's term as prime minister and hung for about two years in the dining room of Sydney social identity and cooking teacher Sue du Val. It won the Archibald Prize in 1992. 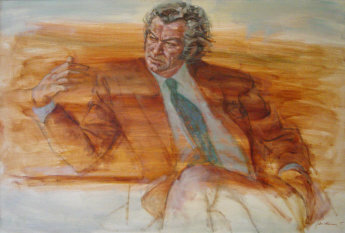 Louis Kahan’s 1975 portrait of Bob Hawke. Museum of Australian Democracy Collection.